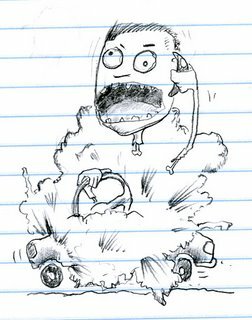 This was the original sketch and after I scanned it I realized that the guy on his cell seemed aware of the car exploding — or he was just crazy talking on the phone. Just to be clear that he was oblivious to the boom, I redid his eyes as you can see below, in the bonus doodle. 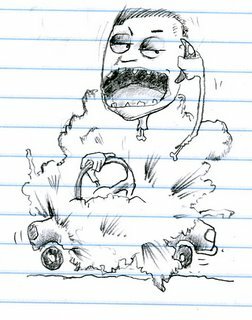 This entry was posted in car, cellphone, doodles, explosion, oblivious, redo, requests, sketches. Bookmark the permalink.